Hey guys i am unable to add my friends even though I have only 39 friends at the moment...Here are a few pics so that you may see my problem..Thanks in advance. 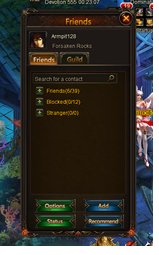 You must be a VIP to expand the limit of your friendslist. But i have only 39 friends..I should at least be able to add 1 more friend minimum since 40 is the limit....Why can\'t I add then??? Hmm. so if I delete them will I be able to add more friends??? Let me check it out and then see.. Thanks for your help though...It was so long since i heard from you guys.... Thanks again. Since VIP is now based solely on diamonds usage, and you can gain enough diamonds to extend your VIP from daily check-ins then you can extend or buy or re-new your VIP and the may limit of your friends will increase! Hmmm I see moonlighty...i know about the vip part but did not know about the blocked friends too..i deleted all my blocked list and i can finally add more friends..Thanks so much guys. 2019-4-27 00:23 GMT+8 , Processed in 0.053991 second(s), 46 queries .